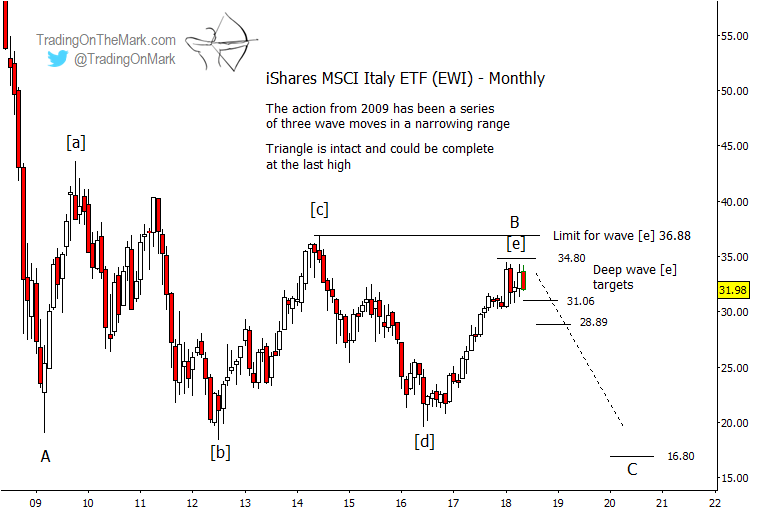 If the Italian stocks ETF we’ve been tracking is on the verge of completing a triangle, the next trending move could take it down to about half its current value. There are some reasons to believe the new downward trend has begun, although it is too early to be certain. 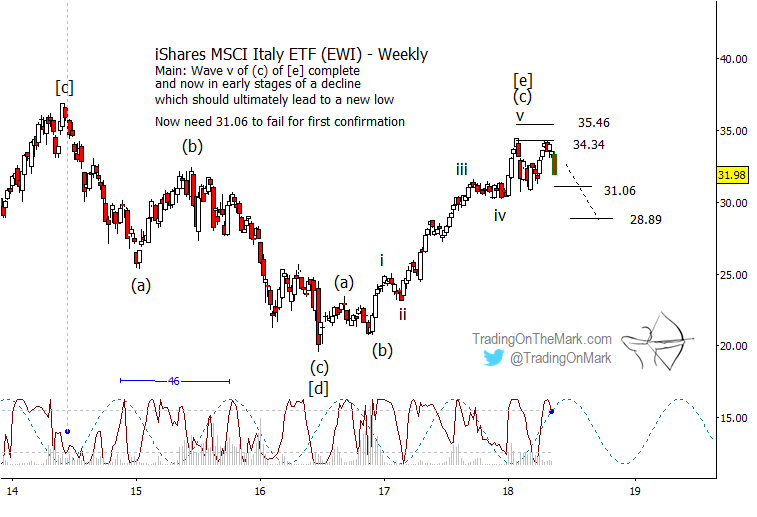 This post offers an update on things for Italy bears to watch for in the iShares MSCI Italy ETF (NYSE Arca: EWI). The Elliott wave triangle remains intact. For the pattern to be a valid triangle, price must not go above the 2014 high of 36.88. In fact price may already have begun reacting to the area near the overhead resistance calculated to be 34.80 on a monthly chart. Initial confirmation of a change in trend would come with a monthly close beneath 31.06 support, and a breach of that level would open the chute for price to challenge the next support at 28.89. The most probable downward target area in relation to the big triangle and the move that preceded it would be near 16.80, or about half of the fund’s current share value. The tiny lower high (or loosely a “double top”) that formed during the past few months might give aggressively bearish traders a structure around which to base their stops even before lower supports are breached. We examine that more closely on the weekly chart. On a weekly chart you can see that price has twice tested the finer-grained resistance level near 34.34. The required form of the triangle’s final swing might have been completed at the first test, although another high is still possible. The dominant 46-week price cycle shown on the weekly chart would be consistent with price beginning to fall from near its current area. With that in mind, we’re making a special subscription plan available to subscribers who intend to take a lighter trading approach this summer. Take out a year-long subscription to TOTM’s Daily Analysis service (charts every trading day for a wide range of markets), and we’ll deduct the cost of three months of service. Basically you get a whole summer of charts for free! The coupon code to take advantage of this offer is “summer”.